After being diagnosed with epilepsy, and deciding to shelve any plans of 'success' in the eyes of his family or the society into which he was born, Kyffin struggled through the entrance exams for the Slade School of Fine Art in London where he studied between 1941 and 1944 From these modest beginnings he developed as a painter, and cites Piero della Francesca as an important early influence. 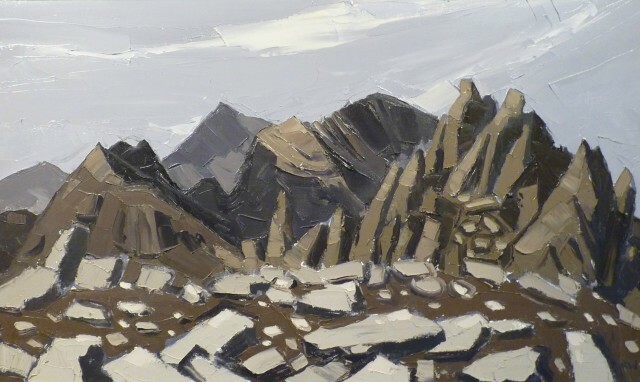 Using a palette knife and thick impasto paint applied in blocks of strong colours and contrasting sombre tones, he succeeded in capturing the often turbulent weather on the rugged Welsh landscape. Kyffin Williams was also a noted portraitist. Awarded an OBE and elected ARA in 1970, he became an RA in 1974. Williams has continued his successful career and has become the most prominent and accessible Welsh artist of his generation. Kyffin Williams sadly passed away on the 1st of September 2006. Colnaghi's Gallery, London; Glynn Vivian Museum and Gallery, Swansea; National Eisteddfod of Wales; Thackeray Gallery, London; National Library of Wales, Aberystwyth; Mostyn Art Gallery, Llandudno; Plas Glyn-y-Weddw Gallery, Llanbedrog. Arts Council of Great Britain; Comtemporary Arts Society; Comtemporary Arts Society for Wales; National Library of Wales; National Museum of Wales; Tate Britain; University of Wales, Bangor & Swansea; Walker Art Gallery; Welsh Arts Council. 1943 - Slade Portrait Prize. 1968 - Winston Churchill Travel Fellowship to record the Welsh Community in Patagonia. 1970 - Elected an Associate of the Royal Academy. 1974 - Elected to the Royal Academy. 1983 - Awarded an OBE.